1. Community Location – Is the community near your ultimate destination or will you be wasting precious time stuck in traffic? Sometimes just a few miles further away can lead to much longer delays and less time at attractions. 2. Security – Is the community private, gated or does it provide security guards? Does the villa have security, fire and pool alarms? Does the villa provide a safe for valuables? 3. Villa Location – Is the villa located close to community amenities such as a lake, dock, community pool and playground? Is the villa located on a main traffic road of the community or a private area? 4. South Facing Pool – Is the pool facing the daytime sun or will you find yourself in the dark and trying to catch the sun in the morning and late afternoon? Does the pool have a heater for fall and winter months? 5. Pool Area – Does the pool area provide enough covered space to enjoy the pool without being directly in the sun? Is their ample pool furniture to accommodate all the guests? 6. Air Conditioned Games Room – Is the games room air conditioned or will you find yourself unable to use the games room due to oppressive heat? Most games rooms are located in converted garages. 7. Space – Does the villa provide ample space for everyone? Does the kitchen provide enough space for stocking supplies and sharing meal preparation while still being able to provide an open and interactive environment? 8. Privacy – Does the villa provide ample space for your family or families to have their privacy? Will late nighters impact those who go to bed early? 9. Communication – Does the villa have high speed wireless internet service (WIFI)? Does the villa provide 24/7 property management support for any emergencies? Are there large flat screen HD TV’s with no HD service? True HD TV must be separately purchased from a cable supplier via convertor box and then attached to an HD TV. 10. Finally – Remember that bells and whistles, fancy and pizzazz are nice and impressive but your comfort and enjoyment will be what is important. After all, the villa will truly become “your home away from home”. Our 2600 Sq Ft Villa is truly a 5 bedroom executive home, large even by Florida standards, with spacious living accommodations for 10/12 guests. Our home, with its South Facing Lake View Pool, is privately situated at the end of a Cul-de-sac in Sunset Lakes, one of Orlando’s most prestigious gated communities. Inside we have a spacious Family Room, with Entertainment Center, and also a formal Living Room. Having two lounges provides an extra benefit to large families or groups enjoying Sunset Retreat. The Family Room is the place to get together to watch Cable TV, or maybe a DVD either rented or one from our small selection of films. All of our TV's were upgraded to flat screen and Large Screen Family Room HD TV has true HD cable service with premium channels. Also, we have High Speed Cable Wireless Internet (WIFI). A desk is provided for all your planning needs. The Breakfast Nook is surrounded by glass with a patio door that leads to the spacious pool area. With its day long sunshine it is a delightful place to sit with your morning coffee and look out at the Stunning Lake View. We have a fully equipped Laundry Room with Washer, Dryer, Sink, Iron and Ironing Board. Our 28' x 14' Pool is South Facing, enjoying day long sunshine and a stunning lake view. We have just resurfaced the pool, added a safety bar, a tropical rock waterfall and expanded the entire pool area. The larger of the two lanais is a perfect place for alfresco dining under the cooling breeze of the ceiling fan and enjoying the sound of the feature fountain. Enjoy an evening drink at your own Tiki Bar situated in the second lanai. Our Games Room is AIR CONDITIONED for your comfort. We stress this because many villas have beautiful games rooms but are too hot to enjoy without Air Conditioning. It has an 8' x 4' Slate Bed Pool Table, Table Football (Foosball), Air Hockey, TV and Playstation 2. For those who prefer to watch the action we have put in a Bar Table, Card Table and Chairs. Below our entertainment unit in the Family Room we have a selection of board games for young and old. To complete the ground floor we have a bathroom with vanity basin and toilet. Luxurious American King Size Bed, Dresser, Bedside Cabinets, Cable Roku TV, Radio Alarm & Ceiling Fan. Adjoining is the elegant en-suite bathroom with corner bath, large shower cubicle, his & her vanity basins, a separate toilet closet and a large Walk in Wardrobe. The beautiful second Master Bedroom has an optional en-suite so it can be adapted to suit your party. It has a luxury American Queen Size Bed, Dresser, Bedside Cabinets, Cable TV, Radio Alarm, Ceiling Fan and walk in wardrobe. The adjoining bathroom has a Large Shower Cublicle, vanity basin and toilet. The special en-suite option feature allows your private bathroom to be easily shared with other guest (on a busy morning rushing to the parks) by opening and closing two doors. Our third bedroom is very spacious and has a llarge American King Size Bed with Dresser, Bedside Cabinets, Cable TV, Radio Alarm, Ceiling Fan and Walk in Wardrobe. Our large Princesses Twin Bedroom has every princess plus Elsa and Anna. It is well equipped with ample drawer space, walk in wardrobe, Radio Alarm and Ceiling Fans. Our Disney Twin Bedroom has Mickey and his friends with plenty of drawer space, walk in wardrobe, Radio Alarm and Ceiling Fan. The 3rd Bathroom features Nemo and has a shower over bath tub, vanity basin and toilet. The low profile tub allows for easy bathing of small children. To complete the upper floor we have a large Linen Closet with a generous supply of all sizes of Towels. We invite you to check our VIRTUAL/VIDEO TOUR and our many photographs. Our family and our extended family in the UK has owned this villa for over 15 years but it has been more then just an income rental. Unlike many owners who rent as an income investment, we spend several months at the villa ourselves. As seasonal snow birds, we keep the property maintained not just for our guests but, also, for ourselves. 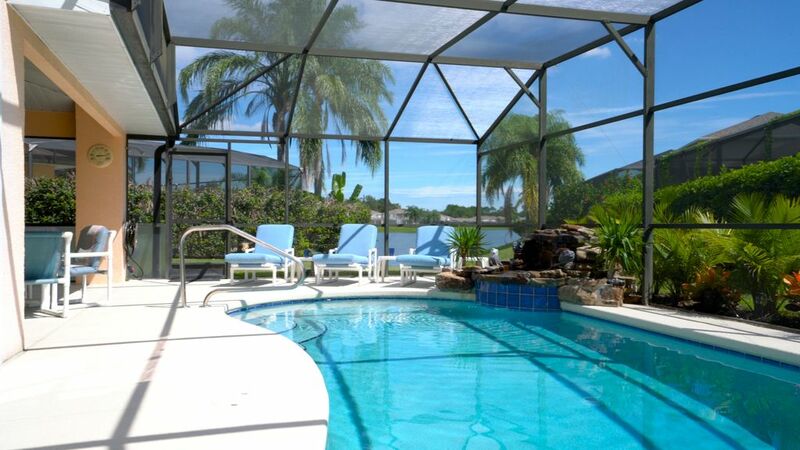 We fell in love with Sunset Lakes and Sunset Retreat many years ago and hope your family will too. There are many outlined in the description but LOCATION is very key as the traffic going to Disney World seems to escalate each year. Our community is very close to the park entrance and is gated. Our villa is located near the main gate at the end of a cul-de-sac with little or no traffic. We are not just owners, we are extended users of our villa. All of our guests complete a survey directly to us so that we can consider their input for correction or upgrade. Many upgrades have resulted from this feedback. Our grandchildren sold us on the idea of Princess and Disney twin bedrooms and a Nemo themed bathroom. toilet, shower, Option allows private use by Suite or use by all Guests. Blow Dryers provided in all bathrooms. World wide limited long distance to non-cell phone locations. In addition to the entire villa the Games Room is also Air Conditioned. Many villas do not have air conditioned games room making them too hot to use during summer months. Black stainless steel french doors. We have a Full Kitchen with an exceptional amount of cabinet and counter space. Recently the kitchen was remodeled to include granite counter tops and a modern back splash. Our Dining Room seats 8 and our Breakfast Nook seats 6-8. There is a large Kitchen Breakfast Bar that seats 2. Outside under our lanais, there are two tables that seat 8-10 and a bar that seats 3. HBO, Showtime, STARZ, Cinemax, and Xfinity On-Demand Movie Channels provided on Family Room and Master Bedroom TV's. Roku TV in Master Bedroom. Huge 19x37 pool with Rock waterfall and underwater light for evening swimming.